Memories can be difficult to hold onto, but what happens when they’re ripped completely away from you? Are you still the same person? 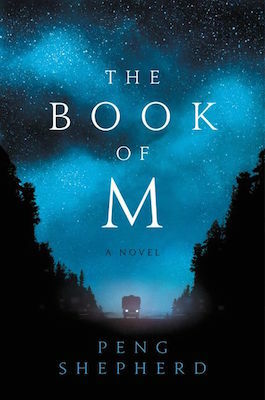 With her debut novel The Book of M, author Peng Shepherd dives into a post-apocalyptic world where those questions take on a terrifying urgency. Shepherd spoke to me recently her debut novel, how her writing process starts off messy, but ends with a great finished product, and, of course, the importance of memory. Sean Tuohy: When did you know you wanted to be a storyteller? Peng Shepherd: I think I always did, truly. When I was five, I was already trying to make my own books, which my mother would get bound and then give back to me. It was sometimes hard to find time to write in university and when I first started working, but the breaks never lasted for long—I just loved it too much. ST: What authors did you worship growing up? PS: Ursula K Le Guin has always been and will probably always be my biggest source of inspiration. Her books were life changing for me, and are among my favorites of all time. There’s another writer too, Michael Kurland, who wrote Perchance: The Chronicles of Elsewhen, which was the first book to make me realize I loved and wanted to write specifically science fiction and fantasy stories. I still have my original copy of that book, which I think is long out of print now, and it’s one of my most treasured possessions. ST: What is your writing process? PS: It starts out messy—when I first have an idea, I’m too excited by the newness of it to plan anything, and end up churning out a bunch of possible scenes and settings and chapters that don’t always match or make much sense. After about 50 pages of this “exploration,” as I like to call it, things calm down a little, and I can see the bigger picture. At this point, I try to think of an ending, and if I can figure that out, then the rest of the story starts to fall into place. ST: What inspired The Book of M? PE: The Book of M was actually inspired by a real-life phenomenon known as Zero Shadow Day. It turns out, every year on a certain day in India, everyone’s shadows actually do disappear—for just a few minutes. I knew that I wanted to write something that involved shadows because they’re eerie and mysterious, but when I came across Zero Shadow Day in my research, I was so fascinated that I had to make it the start of the story. ST: What attracts you to the post-apocalyptic setting? PE: I think post-apocalyptic settings are fascinating because they’re able to ask, in sometimes much more direct ways than other genres, what it means to be human. When all the constraints and systems are removed, who do we become? Is it more true, or less? ST: How much of yourself went into the character of Max? PE: None at all, actually! There are a few other minor characters that have little bits of me or people I know in them, but funnily enough, Max always felt to me like completely her own person—almost more like I met her rather than created her. ST: What is the importance of memory in The Book of M? PE: The idea of memory is really the heart of The Book of M. It’s something we don’t think about most of the time, but memories are such an integral part of a person. They tell us who we are, and what matters most to us. In the story, the characters face situations again and again where they have to decide if their memories are worth more to them or if they would give them up in exchange for something else—and if so, which ones? And would they still be themselves afterward? While writing the book, it made me reflect on the things I value most in my life and what I would do to preserve them, and hopefully readers will be moved to do the same. PE: I’m in the very early stages of working on a second novel. I’m still figuring out exactly where it’s going, but I think it’s going to be a mystery, and set in our present day world this time—with just enough strange occurrences and seemingly impossible moments that the only explanation might be magic. ST: What advice do you have for aspiring authors? PS: As frustrating as this advice is, you just have to write. There’s no way to get better at something without a lot of practice, and writing is no different. There’s also no way to finish a book without actually writing it, either. PS: I’m obsessed with yaks, the animal. It’s become a long-running joke among my friends, who buy me yak stuffed animals or send me pictures of yaks whenever they come across one. They’re just so adorable. To learn more about Peng Shepherd, visit her official website, like her Facebook page, or follow her on Twitter and Instagram.